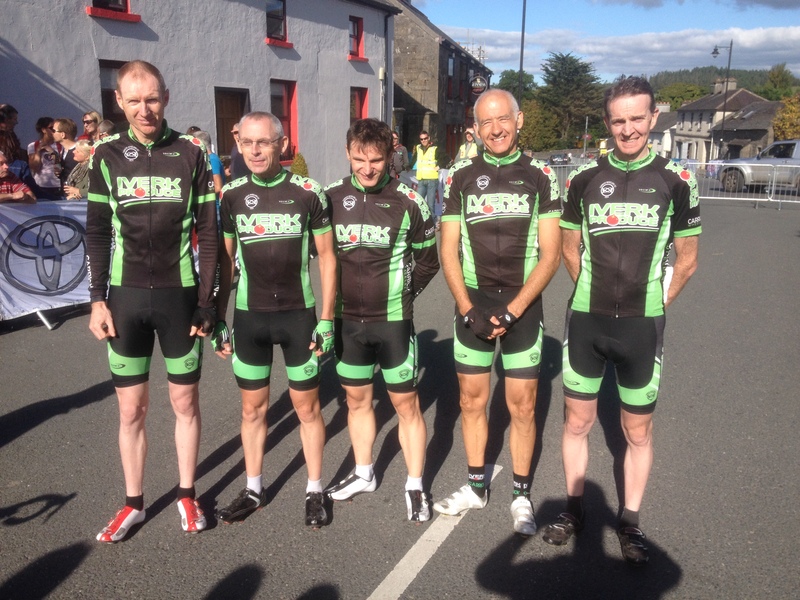 Iverk Produce Carrick Wheelers Riders Joe Kearney, Sean McIlroy, Lenny Foley, Rory Wyley and Hugh Mulhearne have arguably put in the best performance of the season for the Carrick Club last weekend at the National Veteran’s Championships in Multyfarnham, Co. Westmeath. The five-man team that was fielded took home Gold, Silver and Bronze medals from the 116km race. Hugh Mulhearne, a now synonymous name in cycling in Ireland, took a silver medal, his fourth medal from four events in the last two weeks. Former Champion Rory Wyley took a bronze, a fantastic achievement in any aspect, even moreso considering it was his first race all year. In the Team Prize Classification, where the third rider across the line from a team counts, Lenny Foley sealed the performance ensuring Gold for Carrick. Renowned in the sport in his younger days, Foley now has medals from U12, U13, U14, U16, Junior and Veterans Categories. The overall title was taken by Keith Gater of AquaBlue, another Waterford man. The break of the day was instigated by none other than Rory Wyley, a former Champion. After a short spell on the road alone, he was joined by Mulhearne, the defending champion, Gater (AquaBlue), Madden (DigDeep), Troy (Castlebar) and Kennedy (VeloRevolution). Two later, Gater was left alone up front with Wyley and Mulhearne. In the end, Gater was too strong, forging on ahead alone, he won by 35 seconds from Mulhearne and Wyley. The Podium. L-R: Hugh Mulhearne (Silver, Keith Gater (Gold), Rory Wyley (Bronze). After this race, Carrick-on-Suir’s 2014 medal haul has been upped to 17 medals throughout all Categories. 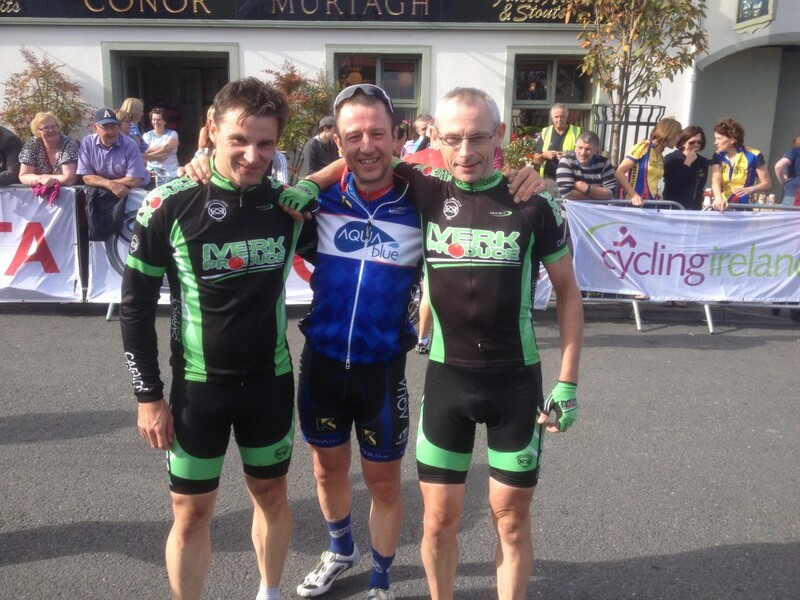 It has been a stellar year for Carrick Cyclists and all involved with the club. Cycling may be classed as an individual sport, but and cyclist will tell you that it as much a team sport as any other. Carrick Wheelers has bookended the categories, with team prizes in the Underage category and in the Veterans category. And with the talent being shown every summer out in the Faugheen Beginner’s League, we’re very confident of the 2034 Veteran’s Team Prize as well. 2014 National Veterans Team Champions. L-R: Joe Kearney, Rory Wyley, Hugh Mulhearne, Sean McIlroy, Lenny Foley. Special mention must go to Sean McIlroy, oldest man in the race but young at heart. He has now been officially “retired” with one year.